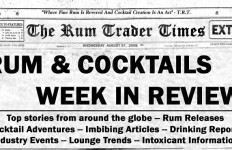 A few year’s ago, the spiced dark rum market was non-existent. There were spiced rums and some dark/black rums available but no one had combined the two until Kraken Spiced Black Rum was released in 2010. With that release a whole new type of flavored rum was born. Since then there has been a smattering of spiced black expression released in the US market including Captain Morgan Black, Hook’s Black Spiced, and Calico Jack Black Spiced among others. 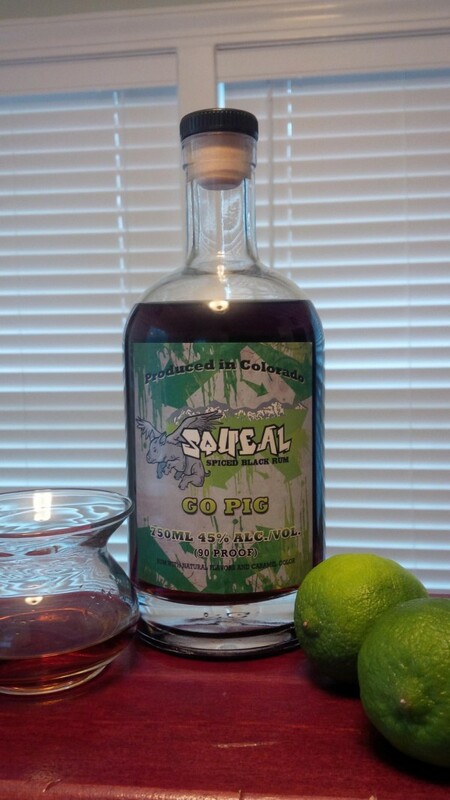 Because of limited growth in the spiced black market I was surprised to discover that a small Colorado craft spirits brand, Squeal Spiced Black, had recently been released. Squeal’s crazy flying pig logo and equally odd name definitely grab your attention. Owner JP Krause, a Colorado native who is passionate about street art, created the logo as a homage to his relationship with his wife Monika. JP and Monika met just days before her return to her native Poland. For JP it was love at first sight and he refused to let thousands of miles keep them apart. The likelihood of their romance working seemed as impossible of pigs flying. With the pig logo in place, the Squeal name seemed fitting. Based in Denver, Colorado, Squeal Spiced Black Rum is presented in a squat, rounded bottle. 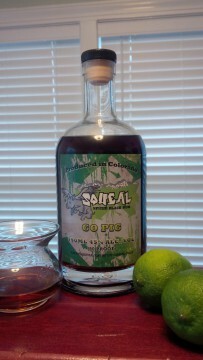 Similar to most other spiced black’s, Squeal Rum carries a slightly higher alcohol content at 90 proof (45% ABV). The front label has a mixed gray and bright green background with the winged pig flying past the Colorado Rockies. The center label encourages consumers to “GO PIG”. Colorado proud and born in the snow-capped Rockies comes our native spin on spiced rum. This small batch spiced black rum combines the complexity of oak & spice with a simple peach finish. Squeal Spiced Black has a strong aromatic mix of molasses and burnt caramel. It also has notes of cinnamon which blends with a hint of smoked meat. It has a slight, oily feel on the palette that is dominated by a spicy mix of molasses, cracked pepper, and anise. It also has a noticeable caramel/molasses bitterness. Adding a few drops of water really helps it’s flavor open up. The aroma moves to a mix of smoke and tobacco; it’s caramel/molasses notes switch from bitter to sweet. On the palette the oilyness disappears and I noticed a brighter sweet fruit flavor followed by spicy pepper and licorice. The finish brings a blend of dry oak, pepper, and bitter molasses. 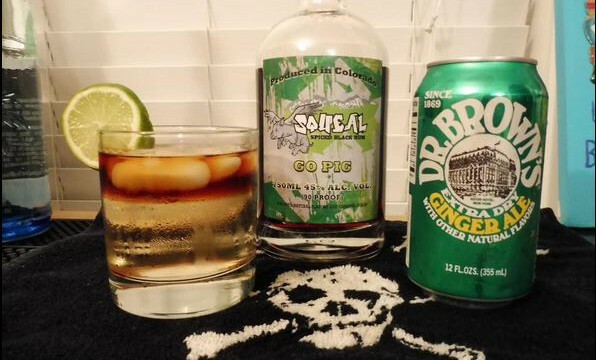 I wanted to try Squeal Spiced Black in a Dark ‘N Stormy but I didn’t have a strong ginger beer so I substituted Dr. Brown’s Ginger Ale instead. The bright, ginger flavor worked well with the Squeal. 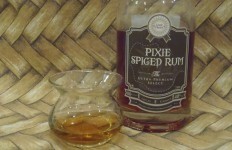 The rum’s peppery, slightly acrid flavor became pleasantly bold and bitter. The taste of dry oak was much more distinct. While looking for the ginger beer, I also pulled out a can of cream soda. The rum’s pepper and spice played off the cream soda’s light vanilla sweetness quite well. 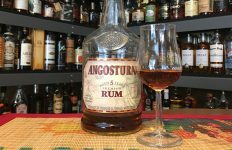 I found Squeal Spiced Black to be a pleasant mixing rum that brings unique flavors to a number of different cocktails. It’s flexibility really surprised me. Depending on what it is mixed with, it is bitter and pungent; spicy and complex; or sweet and subtle. 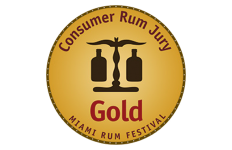 Hopefully the good people of Colorado will take notice of this quality, locally produced rum and it will become available to a wider market.